World Cities Day is observed annually on October 31. It is one of the United Nations observances designed to promote international awareness and action on certain issues. World Cities Day was established by the United Nations General Assembly in 2013. Its main goal is to promote the interest of international community in global urbanization and the importance of sustainable urban development around the world. According to the General Assembly resolution designating October 31 as World Cities Day, fair access to services that meets the needs of every urban dweller is one of the foundations of sustainable urbanization and socio-economic development. One of the tasks of World Cities Day is to raise public awareness of the importance of planned urbanization, because cities that are specifically designed for co-habitation contribute to sustainable use of shared resources. 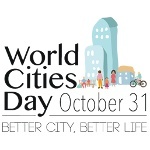 The motto of World Cities Day is “Better City, Better Life”. Alongside the general theme, each year has a unique sub-theme to either address specific challenges resulting from urbanization, or promote major achievements of urbanization. For example, the 2017 World Cities Day was themed “Innovative Governance, Open Cities”. The UN selected this theme to highlight the importance of urbanization as a source of social inclusion and global development.